For a long time there has been a deficit of trained maritime officers in Brazil, as for decades the only accredited training institutes were run by the Brazilian Navy, where a very limited number of prospective maritime deck and engine officers could be trained at its two training institutes in the country. That's all changing now with the Institute of Nautical Sciences (ICN) leading the way. With the discovery of the pre-salt in 2007 and the continued growth of the maritime and offshore sectors, the lack of qualified Brazilian officers became acute. For many years, and even today, most offshore captains and officers are foreigners, while there is a more significant number of local captains and officers in the merchant fleet. Yet compared to most seafaring nations Brazil is still lagging in terms of private maritime training, which until only a few years ago. With an offshore fleet of more than 400 vessels operating along the large Brazilian coast and with expectations of further growth due to the continued offer of offshore pre-salt and post-salt plays in recent and upcoming tenders, expanded training facilities for local maritime officers has become vital to the growth of the maritime sector in Brazil as there is also an unprecedented oceangoing ship construction program under way through the Promef program, whose main client is Petrobras’ maritime company Transpetro, which although marred by a corruption scandal, continues to order new built DP capable tankers for oil export and DP capable shuttle tankers designed to unload oil direct from FPSOs located over remote pre-salt plays, usually located around 300 km from the coast. The creation of the Institute of Nautical Sciences – ICN – as a private organization of public interest whose permanent objectives are the production of knowledge and teaching related to the activities developed in the various segments of the maritime and offshore sector, as well as the socialization of information and knowledge to the community concerned, has been a key factor in increasing the number of trained officers and seafarers in Brazil. “In order to achieve these objectives the ICN has invested heavily in research in order to contribute to the technological development of the sector. The ICN develops courses, conferences, seminars and other forms of dissemination of knowledge and exchange of information, aiming at the continuing the education of the seafarers who already work in this area and the professional training of those who wish to enter the maritime market. The ICN also develops didactic materials, software (programs) and alternative teaching methods in order to support maritime and offshore development in all its segments. The ICN aims to be an international reference in specialized education in the maritime and offshore sectors, with the support of multidisciplinary research and studies, being an innovative organization, based on the principles of the Quality Management System,” said Andre Carvalho, Director President of ICN. ICN has its main office in downtown Rio de Janeiro adjacent to the Navy yard and the Port of Rio, overlooking Guanabara Bay, and also has a large and state-of-the-art training center, on the other side of the bay, in the Municipality of Maricá, around 60 km from downtown Rio. Where large groups of seafarers and prospective seafarers and practice hands on ship operations, safety and survival techniques, utilizing real life boats on davits, helicopter simulators, among other forms of hads on training. In November 2000, the ICN initiated the development of courses related to IMO Resolution A.891, IMO Resolution 1079 (courses for personnel working on offshore mobile units), concluded in early 2002, after which, following an evaluation by Bureau Veritas, it was accredited by the Liberian Maritime Authority. At the end of the same year, it began the evaluation process carried out by Petrobras, which, on behalf of the Brazilian government, was delegated by the Ports and Coasts Board. In May 2003, it obtained the accreditation of the Brazilian Maritime Authority. The ICN is also recognized by the Maritime Authorities of Liberia, Marshall Islands, and Vanuatu, and has been officially nominated as a Filling Agent by Liberia and Marshall Islands, in addition to its ISO certification 9001 Quality. “Considering the approval of this institution in rigorous evaluations and its commitment to the teaching and development of the maritime and offshore areas, we can affirm that the ICN is an organization of international recognition, whose main highlights are the faculty, composed of researchers and professors with extensive experience, and an internationally accredited quality system,” said Carvalho. The Institute of Nautical Sciences (ICN) is a truly a reference center in training for the offshore and maritime sector of international recognition and directly accredited by the major Maritime Authorities of Brazil and from abroad. In addition, in seeking continuous improvement, meeting the expectations of customers, concern with the environmental impacts in its activity, preservation of the environment, working conditions and safety in its processes, ICN obtained the certification in Quality (ISO 9001). Only the Maritime Authority of Brazil (CIAGA and CIAGA) can teach courses for waterways / seafarers (Deck / Machine Helper, Boat Deck/Machinery) with CIR emission (Registration and Registration Book), enabling the crewing and operations of ships, offshore vessels, tugboats and safety craft. The modern bridge simulator at ICN was developed in Brazil and is considered a showcase of advanced maritime training, being one of the only such simulators in Brazil and all of Latin America. Simulators have been employed in different areas since the First World War, but have been under intensive development since the late 1940s, along with computer technology, sonar and radar technology. The Navigation and Maneuvering Simulator - SIMNAV - was developed by ICN in 2011 as an aid to the teaching for the preparatory classes for the PILOT CADET exam. The first class occurred in December of the same year. “As the first bridge simulation system developed entirely in Brazil, SIMNAV is also a technological milestone in the field of maritime training, presenting unique algorithms and system architecture. It offers an ideal environment to familiarize mariners with bridge procedures. The complete bridge station can receive groups of up to five students simultaneously. The SIMNAV system is composed of a command console, ECDIS, radar, communications, and large monitors that reproduce the virtual environment outside the ship. In addition, there is a dedicated station for the instructor, focused on creating and monitoring exercises,” said Luis Felipe, Director of the SIMNAV program. 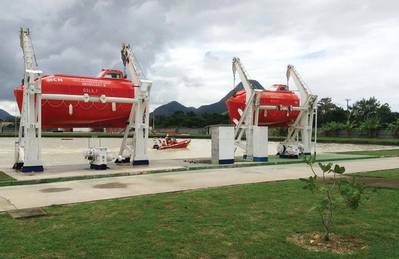 The Offshore Training Center (CTO) is a professional maritime improvement center, located in Itaipuaçu, Maricá, in the northeastern coastal region of the state of Rio de Janeiro, 60km from the capital. It is administered by the Institute of Nautical Sciences (ICN) and offers several courses in the area of maritime and offshore support, duly accredited by the Brazilian maritime authority and by some international authorities. It is the only establishment of its kind in the southern hemisphere. Currently, the project is fully functional, and all facilities are completed: one firefighting exercise yard and the other for specialized exercises; a large water tank for practice with survival and rescue craft; a pool for personal survival exercises; operational and administrative annexes; a helipad; a building for classrooms and simulators, with a total capacity of 300 students, an auditorium for 200 and a parking lot for cars and buses. An accommodation area also provides 30 rooms and bathrooms, which allows the simultaneous accomodation of 120 students, with its capacity expandable to 240 students. “Practically all the simulators at the CTO are nationally built and developed by the ICN itself. They manage to virtualize various vessels and ship activities such as marine communications (GMDSS), dynamic vessel positioning (DP), loading and unloading (FPSOs/Tankers); maneuvers (Ships/PSVs/AHSVs/Tug Boats) and ballast and demarcation operations. Among the courses offered by the Institute are those of ballast operator, maintenance supervisor, vessel supervisor and platform manager. Altogether, in seven years, more than 25,000 seafarers received certificates issued by the institution and the expectation is that this number will increase significantly in the coming years with the increase in pre-salt and new post-salt exploration activity,” said Felipe. With new oil field developments already ongoing in the Santos and Campos Basins, off the Northeast Coast, and in the Equatorial Margin and long with the revival of cabotage, and increase in inland waterway navigation, private maritime academies such as ICN will be key factors in increasing the number of trainer local sailors and officers to supply the expected future demands of the offshore and maritime sectors in Brazil.